Erica croceovirens E.G.H.Oliv. & I.M.Oliv. 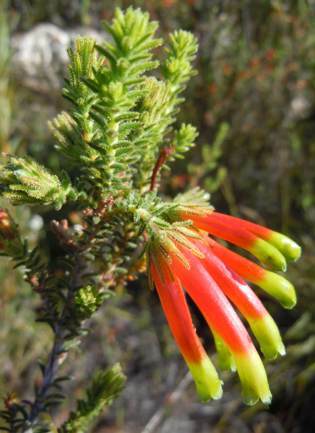 Erica croceovirens is a newly described species which is closely related to other tubular southern Cape species such as E. versicolor, E. diaphana, E. unicolor and the E. discolor complex. It was discovered by botanist Jan Vlok in 1989 and its name was first published in 2005. Erica croceovirens is a scraggy shrub growing up to 1.5m tall with a few, upright, strong, woody branches and bushy lower growth. Side branches are short (20-30mm long) and arranged in groups (whorls) of 4-8 at nodes on the upper main stems. The leaves are small and covered with fine hairs, some of which are gland tipped. The flowers are tubular, glabrous and sticky, and arranged in whorls of four at the ends of short secondary branches. The flower tubes are straight or slightly curved with the lower two-thirds bright orange and yellow-green towards the mouth. Stout gland-tipped hairs are found on the stems and leaves. This species is not threatened as it grows in a conserved area. It has however been Red Listed as Critically Rare due to its very restricted distribution of less than 10 km². Erica croceovirens has a limited distribution being confined to a small area in the Doringrivier Wilderness Area on the northern slopes of the Outeniqua Mountains between the Outeniqua and Robinson passes. It grows in well-drained sandy, acidic soils on open slopes, in short fynbos, and is particularly prevalent on rocky slopes. This species has been given a name descriptive of its distinctive flower colour combination. The specific name croceovirens is derived from the Latin croceus describing the saffron-orange or yellow-orange colour of the lower flower tube, combined with virens referring to the green-yellows of the upper part of the flower. Erica croceovirens is unusual because it can be either a single-stemmed reseeding or multistemmed resprouting shrub. The usual fire survival strategy for a species is to be one or the other, but not both. Seeds develop in a dehiscent capsule, from which they are spread by the wind, or they adhere to the sticky flowers, which may be blown around after they have fallen from the plant resulting in further seed distribution. Reseeding shrubs produce many seeds which readily germinate after fire and this species grows on open rocky slopes where it is exposed to fire. The resprouting forms will burn and re-grow from a persistent, underground rootstock. Erica croceovirens flowers from August to February and is adapted for pollination by sunbirds that visit the flowers for their nectar. To reach the nectar, sunbirds push their beaks into the corolla tube, tripping the anther ring in the process. Pollen is deposited on the culmen (upper ridge of the bird's beak) and carried by the bird to the next flower where some pollen will stick to the stigma resulting in pollination. Erica croceovirens is similar to many of the long-tube species common in the southern Cape. It was added to the Kirstenbosch collection in 2012 and has proven to be easy to grow with no cultivation problems. It should therefore be a reliable garden plant for sunny, well aerated positions under average Mediterranean conditions. Erica croceovirens is ideal for warm, sunny gardens. It is easily grown from fresh seed which should be sown in late summer or autumn. Germination is greatly enhanced by the application of smoke which mimics the conditions in nature. Sow seeds onto a well-drained, slightly acidic growing medium consisting of a combination of river sand and well decomposed pine bark in roughly equal proportions. Seeds germinate in about six weeks, emerging as tiny, delicate plantlets that must be lightly watered with a watering can. Let the seedlings grow to about 10mm tall before pricking them out into small individual pots. Young seedlings are encouraged to grow by feeding them every week with a diluted organic fertiliser. It is advisable to plant out during the cooler autumn or early winter months to allow the plants to establish before the onset of summer. This species is, relative to other ericas, easy to root from cuttings because plants produce good rooting material in the form of side shoots near the ends of main stems. Cuttings are rooted in autumn or spring, in multi-trays on heated benches under mist spray. Select small tip or heel cuttings about 20-30mm long, taking thin wood from the previous season's growth. Heel cuttings are preferred where a short side shoot is removed from the stem. The base of the cutting is treated with a rooting hormone for semi-hardwood cuttings which are then placed into a rooting medium of 50:50 fine-milled bark and polystyrene or perlite pellets. The saffron heath grows in acidic well-drained soils in full sunlight. It is tolerant of a range of habitats including rockeries, embankments, or just a normal, sunny, garden bed. Good watering once a week during summer months is recommended for the first year after planting. It grows well in containers, provided that the correct, well-draining growing medium is used. Fynbos planting medium is made up of a combination of equal parts composted pine bark or pine needles and river sand. A little (20%) loam may also be added. It is a woody species, so regular pruning is recommended to keep the plants well branched and compact. Plants that are pruned are more presentable, last longer and produce more flowers. Erica plants are adapted to living in poor soils, but, for best results, should be regularly fed with diluted organic liquid or small amounts of organic pellet fertilisers (5:1:5) that are low in phosphorus. Manning, J. & Goldblatt, P. 2012. Plants of the Greater Cape Floristic Region 1: the Core Cape Flora. Strelitzia 2 9 . South African National Biodiversity Institute, Pretoria. Oliver, E.G.H. & Oliver, I.M. 2005. 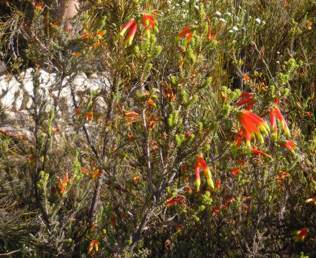 The genus Erica (Ericaceae) in southern Africa: taxonomic notes 2. Bothalia 35: 141.